To use Ranked Play, you must first acquire a HotButton. If you do not have a HotButton, please contact your local operator for details on how to obtain one. 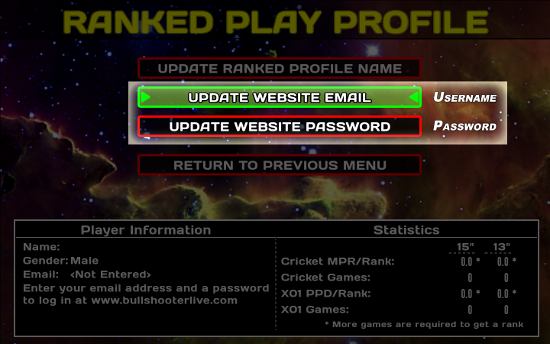 Secondly, go to a Galaxy 3 Live Dartboard and create a Ranked Player Profile. To do this, simply apply your HotButton to the reader on the machine, and follow the on-screen instructions to create a profile. Once you have created your profile, don’t stop; there is one more step! You need to open Ranked Play Profile, as shown in the screenshot below. When you are finished setting up your Website Email and Website Password on the Galaxy 3 machine, you are ready to sign into BullShooter Live! Please note that you are not required to provide a Website Email or a Website Password in order to play ranked games with your HotButton; however, if you do not provide them you will be unable to log into this website. If you have already registered a HotButton for ranked play but you did not provide your email and password, you can still do so. 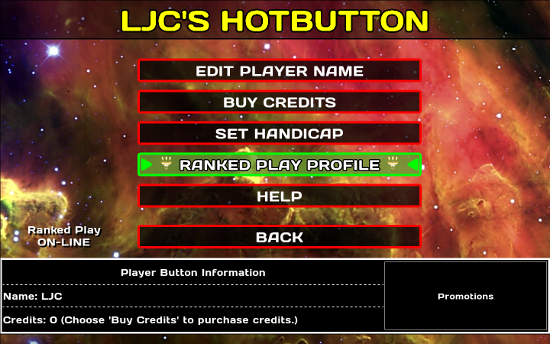 Simply touch your HotButton to any Galaxy 3 machine and select Ranked Play Profile as described above.